The Florida Highway Patrol has arrested a man who, troopers say, was the driver in a hit and run crash Monday (May 15) that injured two boys on bicycles, the Florida Highway Patrol said. 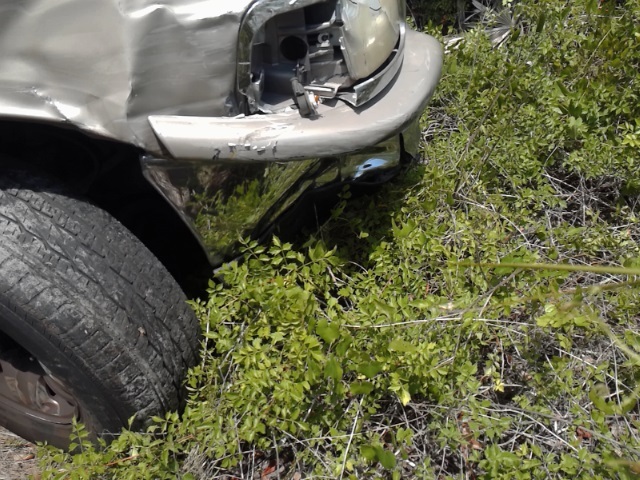 PASCO COUNTY – The Florida Highway Patrol has charged a Hudson man with a hit and run crash that left two boys injured Monday (May 15). Christopher Michael Try, 20, of Hudson, was charged with leaving the scene of a crash with injuries and reckless driving. Troopers said witnesses positively identified Try on Wednesday (May 17) as the driver in Monday’s crash, which also damaged a parked car and a house. Late Wednesday night, Pasco sheriff’s deputies spotted Try on U.S. 19 N and held him for FHP troopers. Earlier in the day, troopers said they located the vehicle Try was driving. It was in a wooded area along a private drive behind a Hyundai dealership by Pasco County mosquito control workers who contacted the FHP. Troopers came to the area and recovered the vehicle, a gold 1998 Ford Expedition. It will be examined for evidence, the FHP said. The Ford’s owner had reported it stolen. The crash happened about 3:55 p.m. in Holiday. Troopers said a 1998 Ford SUV was traveling south on Windham Drive approaching Moog. The driver of the SUV failed to stop for the stop sign at Moog, turned left onto Moog and lost control of the SUV. Troopers said the SUV traveled onto the shoulder of the road, then back across the roadway as the driver over-corrected. The SUV then went onto private property at 3922 Moog where it collided first with a mailbox then with a 1999 Chevrolet pickup truck that was parked. The impact pushed the Chevrolet into the home at 3922 Moog. The SUV continued along the shoulder and collided with Johnny a Walsh, 14, troopers said. The SUV continued traveling and hit a second mailbox at 3928 Moog. Debris from that collision hit Johnathan T. Soto, 12. For a video of the crash, go to facebook.com. 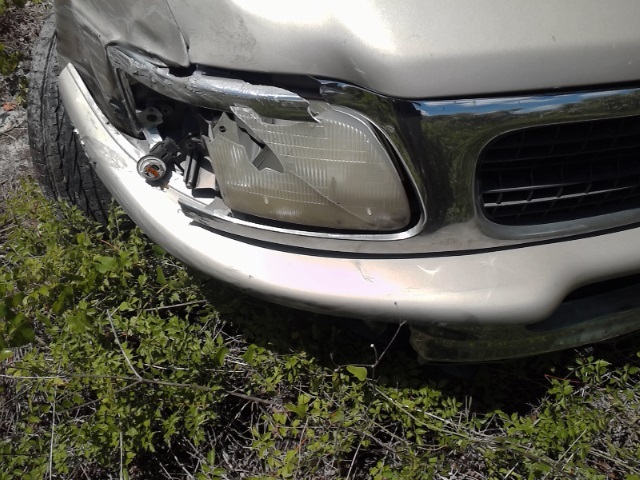 Photos of car courtesy of the Florida Highway Patrol. Photo of crash is a screen grab from the video. 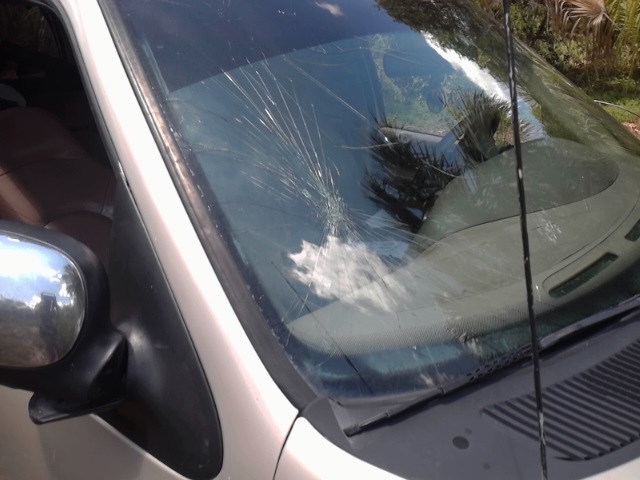 The vehicle was involved in a hit and run crash Monday (May 15) that injured two boys on bicycles, the Florida Highway Patrol said.